Compare current package.json dependency version numbers with latest remote version number. 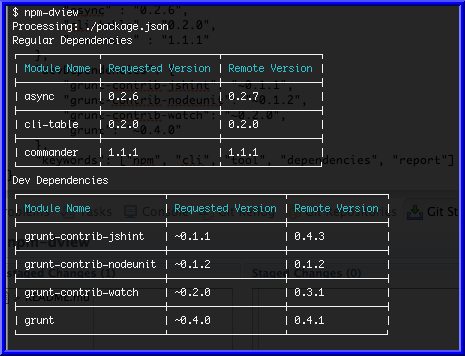 npm-dview is a command line tool for comparing a package.json file's dependency version numbers with the latest remote version number. It compares both "dependencies" and/or "devDependencies". It accomplishes this by calling "npm view MODULE_NAME version" for each dependency listed in your package.json file. adding --excludeCurrent command line option. stop trying to get remote version for urls. stop processing urls and don't update package.json with ??? auto updating package.json when --update option is passed. New columns: "Local" and "Current?" Changed column name: "Requested Version" -> "Requested"
Changed column name: "Remote Version" -> "Remote"
Split cli logic into new file, and expose a function that allows other libraries to use this via require('npm-dview').